A week ago, I shared tips on how to take a screenshot on the Samsung Galaxy S5. Here’s another tip for anyone puzzled by the way calendar entries feature your LinkedIn profile. 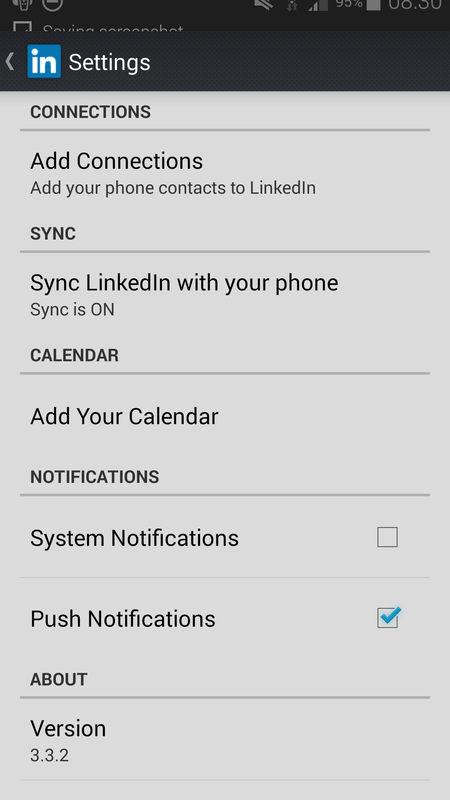 When you download the Android LinkedIn app, the S5 by default syncs your calendar with your profile. LinkedIn’s blog explains that this means you can find out about people who email and meet you. So far, so useful. But the first time I got a calendar meeting alert on the S5, I got a blast from the past. It said I was management trainee at Nationwide Building Society – a job I left in 1987 when I moved to head office as press officer! Friends say they have had the same experience. You can see above that my LinkedIn app is syncing with my phone. I’ve not yet found a way to get it to recognise my current rather than my first job. So I’ve switched off syncing. This is simple: open the LinkedIn app, and click the three dots on the top right of the screen to open the settings page. Click on the sync bar on the screen above, which will bring up the sync page, below. Toggle the On button to Off (top right) to stop the app syncing. I’ll keep it switched off until LinkedIn solves the mystery. You may want to do the same, unless you’re desperate to know what everyone’s first job was! 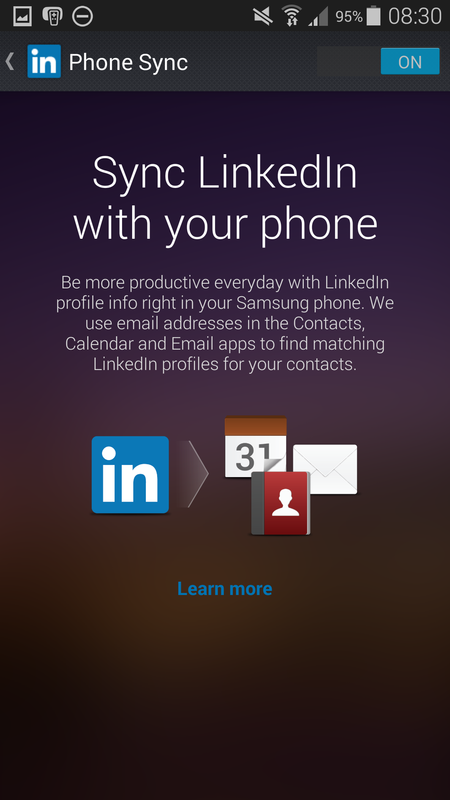 This entry was posted in Tech and tagged LinkedIn, Samsung Galaxy S5 by Rob Skinner. Bookmark the permalink. I have the same problem Rob, also on a Galaxy S5. It shows my very first job.